Would you like the chance to win an entire case of FAGE Greek Yogurt? BlogHer is giving away an entire case of FAGE every day for the next 30 days! Check out my recent review of FAGE to learn all the details! Grab the yogurt while you can, kiddies...it's the real stuff - Greek yogurt! Awesome! I am addicted to Fage and this would cut down on my weekly grocery bill. Ahhh...heck who am I kidding if I actually won I would probably end up spending more experimenting. I am just saddened that it just isn't available here. I too, am addicted to Fage. Have it at least three days a week for breakfast with some fresh fruit. I'll have to go see about winning some. How do you guys think Chobani compares to Fage? I bought some Chobani to make homemade tzatziki at a friends urging... I wasn't SUPER impressed with it, but she went on and on about it, so I thought I was missing something. The fruit ones are ok....but *shrugs*Maybe I'm not a greek yogurt person...I dunno. Any ideas before I shell out the extra dough for Fage? Huh. I don't think I've ever had Fage! I have had Chobani though and now I'm curious about how the two compare. Good luck, everyone! I hope you'll let me know if anyone wins one of the free cases of yogurt!! :-)Leslie: I know it's expensive, but you should give FAGE a try before making a decision about Greek yogurt. I've never been impressed with the other brands, although I've never seen or tried Chobani. If you do decide to give it a try, come back and let us know what you think!Ari: I haven't seen Chobani here, so I have no idea how they compare. But if you give FAGE a try, I'd love to hear what you think! Hey Ari, Cobani is pretty good too but truely, nothing compares to fage... especially the 'total' one (the full-fat, plain kind) :) try it.. I can leave a comment on that for the contest for some reason *cries*I finally tried some Fage.... only flavor I could find was honey and holy monkey.... I'm sold.I was just diagnosed with gestational diabetes and with this, I'm able to trick my body into thinking I'm eating something really bad for me!!!! !WAY better than Chobani, absolutely no contest. Wow. I wish I could get on there and leave a comment to win a case! That's the only way I'll be able to afford to keep up with the amount of this stuff I'm gonna wanna eat! Leslie: I think you have to register with the Blogher site (it's not that difficult) in order to leave a comment, did you try that? I would hate for you to miss out on the contest! The honey flavor is great! But I love to buy the larger tubs of plain FAGE 2% and add my own honey! I also love Fage. I use it for all sorts of marinades and desserts. Yum! You'd think there was some crack in it --- it's that good! Thank you for educating people about this wonderful product, Hopefully, Greek-style yogurt will become more available and affordable. Wonderful stuff. Oh, FAGE! I buy the plain yogurt and add a good honey, or various jams (rosehip jam is delicious) when I want to eat a bowl on its own. I use it to top curried lentil stew. I add it to mango puree for a mango lassi. How can something so delicious ALSO be good for you??? 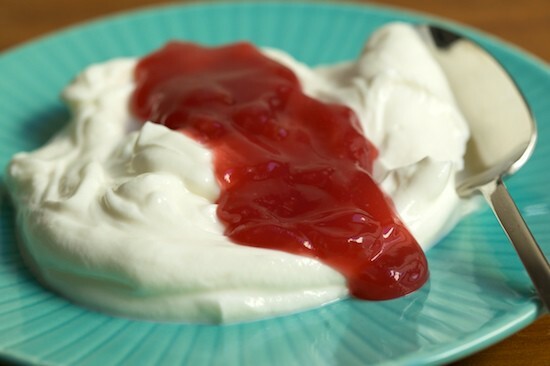 fage yogurt makes the best dips, you can use it in replacement of sour cream, you can sweeten it, there are tons of ways to use this incredible yogurt!! Yum! Thank you and thank you! Erin: That is so AWESOME!! Congrats! Oy! A whole case of FAGE?!?!?!?! Too bad I am a man. BlogHer has nothing to do with me unfortunately - Or - do I have any hope?Gabi @ Mamaliga. I won too! Thanks for the link...I'd never tried the Fage due to not wanting to spend nearly $2 on yogurt that I may or may not like, but now I'm worried that I'll fall in love with $2 yogurts and my husband will gasp at the grocery bill :-p ha ha, oh well. I think I've got more expensive food habits than the occasional Fage. I just love eating it slowly right from the container. I love breaking the seal then looking upon the color white that is so pure, all glistening and beckoning me to devour. I love FAGE!! !